Active ingredient: Enoxaparin Sodium BP. Solvent: Water for injections BP. Each ml of the solution contains: 10000 anti-Xa IU equivalent to 100 mg Enoxaparin Sodium. 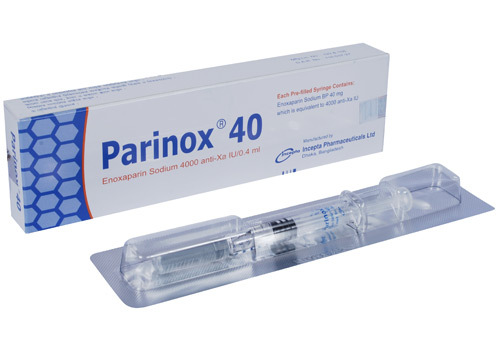 Parinox 40: Each pre-filled syringe (0.4ml) contains 4000 anti-Xa IU is equivalent to 40 mg Enoxaparin Sodium BP. 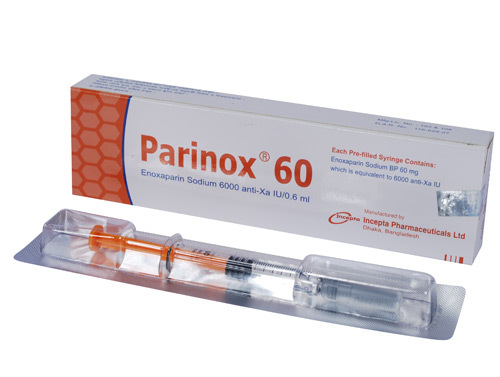 Parinox 60: Each pre-filled syringe (0.6ml) contains 6000 anti-Xa IU is equivalent to 60 mg Enoxaparin Sodium BP. 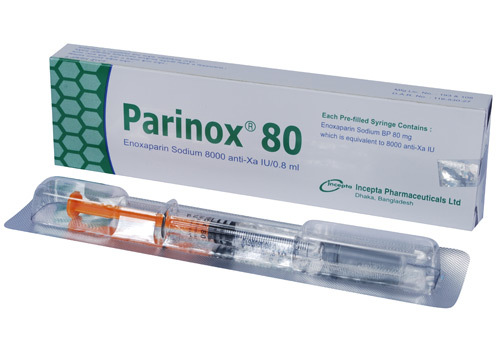 Parinox 80: Each pre-filled syringe (0.8ml) contains 8000 anti-Xa IU is equivalent to 80 mg Enoxaparin Sodium BP. Enoxaparin is a low molecular weight heparin with a high anti-Xa activity and with a low anti-lla or anti- thrombin activity. At doses required for the various indications, Enoxaparin does not increase bleeding time. At preventive doses, Enoxaparin causes no notable modification of activated Partial Thromboplastin Time (aPTT). It neither influences platelet aggregation nor binding of fibrinogen to platelets. Enoxaparin is primarily metabolized in the liver. Treatment of deep vein thrombosis, with or without pulmonary embolism. Prevention of thrombus formation in the extra-corporal circulation during haemodialysis. particular those which may be associated with orthopedic or general surgery. including cardiac insufficiency, respiratory failure, severe infections, rheumatic diseases. No dosage adjustment is required in patients with moderate (creatinine clearance 30-50 ml/min) and mild (creatinine clearance 50-80 ml/min) renal impairment. But, all such patients should be observed carefully for signs and symptoms of bleeding. For patients with severe (creatinine clearance <30 ml/min) renal impairment the dosage adjustment for Prophylactic dose is: 2000 IU once daily and Therapeutic dose is: 100 IU/kg once daily. Elderly: No dosage adjustment is necessary, unless kidney function is impaired. Children: Safety and effectiveness of Enoxaparin in pediatric patients have not been established. Haemorrhage (bleeding), Thrombocytopenia, elevations of serum aminotransferase. Pain, bluish marks at injection sites to skin rash at injection sites. Cases of neuraxial hematomas with the concurrent use of Enoxaparin and spinal/epidural anesthesia or spinal puncture have resulted in varying degrees of neurologic injuries. Enoxaparin injection should not be administered by intramuscular route. 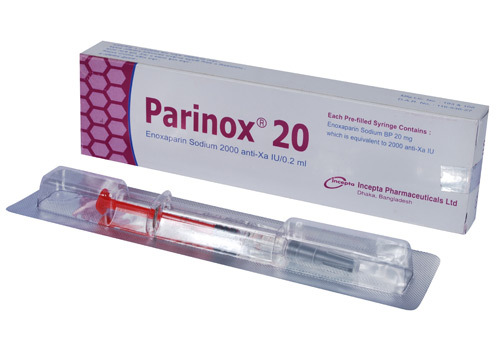 Enoxaparin should be used with caution in conditions with increased potential for bleeding, such as impaired hemostasis, history of peptic ulcer, recent ischemic stroke, uncontrolled severe arterial hypertension, diabetic retinopathy, recent neuro or opthalmologic surgery and low weight patients. It is recommended that the platelet count be measured befored the initiation of the treatment and regularly thereafter during treatment. Pregnancy category B. In humans, there is no evidence that Enoxaparin crosses the placental barrier Enoxaparin should be used during pregnancy only if the physician has established a clear need. Enoxaparin is not recommended for use in pregnant women with prosthetic heart valves. It is not known whether this drug is excreted in human milk. Because many drugs are excreted in human milk, caution should be exercised when Enoxaparin injection is administered to nursing women.